This is a fresco from a temple in India. The temple is in Varsana, in the Vrindavana area, the place where the goddess Srimati Radhika is said to have grown up, during her pastimes in this world. Yesterday I spent some time with a group of friends, there in the temple, discussing this piece of art. The intriguing aspects of this fresco are so many, the discussion it provoked so lively, that I am compelled to present my perspective, for posterity. I will try my best to do this in language resembling that found in art history books, with a few weird breaks from that form. Firstly, and overview of what is occurring. 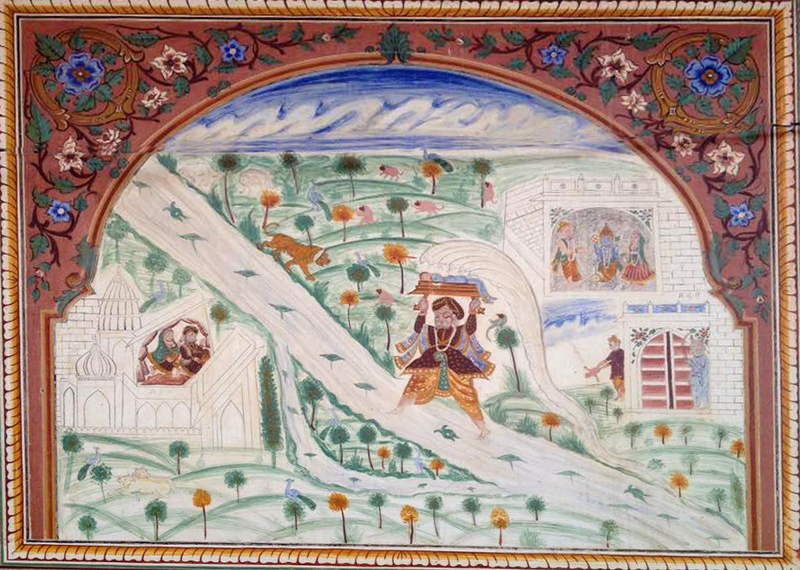 This painting shows Vasudeva Maharaja carrying the child Krishna across the Yamuna, from Mathura to Vrindavana. He did this to bring Krishna beyond the reach of the cruel Kamsa, lest that tyrannical king should smash the baby, as he did many others before. In the upper right, Krishna is appearing to Vasudeva and his wife Devaki. He manifested initially in the form of four-handed Narayana, before transforming into Baby Krishna, at the request of Devaki. It’s a deep and intricate pastimes, and here we (I?) am just touching on it. Below that, Kamsa is shown smashing one of Vasudeva and Devaki’s previous children. On the left are Vasudeva and Devaki praying, or possibly Nanda Maharaja and Mother Yashoda awaiting the arrival of Krishna, as one local sadhu asserted. First of all, the relative size of the people and things in the painting is completely relative to their importance to this instance of the pastime. Western figurative art tends to mimic the camera (well, the laws of perspective preceded the camera). Western abstract art is, in this author’s humble opinion, mostly terrible, and not worth writing about. But what we see in this painting is different. Compared to what a camera sees, it is completely wonky. Vasudeva is taller than a building. A palace isn’t much taller than Nanda Baba would be if he were standing. But the entirety of the pastime could not be conveyed in one frame if the artist limited themselves by imitating a camera’s view. Instead, the size of the elements is relative to their importance. Vasudeva carrying Krishna is what this picture is mainly about, therefore they are the largest. The palaces are just there to give context, so they’re small. The personalities inside the castles are important (but not as important as Vasudeva Maharaja) so they are quite large. The trees and so on are also there for context, so they’re small, whereas the jackal upstream from Vasudeva is large (it showed him where he could cross). This is all absurd from the point of view of visual perspective, but that’s what’s so great about it. Furthermore, not all the events in this painting took place at the same time. Kamsa is shown killing a baby on the right, something he did previous to Vasudeva Maharaja crossing the Yamuna river. Narayana is shown appearing to Vasudeva and Devaki, which happened earlier that night. On the left hand side, one local sadhu told us, Vasudeva and Devaki are shown praying, before the birth. I’ve seen a picture of Lord Rama where He crosses the Ganges River. In one picture, He is shown there with Sita and Lakshan on one bank, and on a boat in the middle, and offering respects to a sage on the far side. It was a bit like if someone shot pictures with a camera for an hour or, then put everything they capture into one frame. Except very different from what a camera sees, but that we covered. So in this one picture of Vasudeva Maharaja crossing the Yamuna River, we have events happening at different times, and size relative to importance. Intriguing stuff. Let’s see what tomorrow brings.